Archangel Zadkiel is known for helping students remember facts and figures for tests; healing painful memories and choosing forgiveness. This track is also recommended for meditation. MP3 downloads cannot be refunded or replaced once purchased. Your download will be automatically sent to the email provided. Link is active 2 days and has limited access. Note: Professional Versions are specially mixed to offer 60 minutes of uninterrupted play. Comes with 1 year free license on request. Note to mp3 download: Track is downloadable as a zip file. The mp3 will need to be extracted before playing. Most systems have built-in zip reader however by default some iPhones / Ipads have issues with opening and downloading mp3 or zip files. This guide will show you how to open zip files on the iPhone, allowing you to download compressed files from a website to your iPhone/Ipad and unzip it so that you can use the file inside: http://goo.gl/hARW85 If you still experience problems, we suggest to download file to computer/laptop and then transfer to your equipment. Archangel Zadkiel wishes to remind you of the healing power of forgiveness. Archangel Zadkiel asks you to stop punishing yourself and to release the negativity in your heart and move on. Archangel Zadkiel is the archangel of transformation and transmutation. 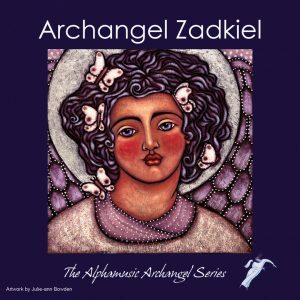 By choosing Archangel Zadkiel you are expressing a desire to accelerate your spiritual development. Call forth Archangel Zadkiel to help you to strengthen your link with the divine. Archangel Zadkiel can also help you to transmute negative energy. Archangel Zadkiel works with the high frequency spiritual energy known as the violet flame. Connect to Archangel Zadkiel if you wish to transmute dense negative energy into positive energy, purify body, mind and soul, remove energy blocks and accelerate your spiritual development, transmute negative karma and heal past lives. Transmute negative energy arising from wars etc. Forgiveness is a great healer, without it negative energies such as anger, hatred and guilt will build up and cause health problems. Invoke Archangel Zadkiel if you are unable to forgive others or yourself, if you feel anger, hate, bitterness and resentment towards others, if you find it difficult to tolerate others, if you are unable to tolerate aspects of yourself, if you find it difficult being tactful. As I relaxed and listened to each of these Archangel CDs I was surprised how clear and strong the message of each Archangel was for individuals and for humanity. Thanks for the follow! I can tell your music works, just ordered! Right from the outset, I wasn’t disappointed with John’s music and it started to work almost immediately. My anxiety symptoms including periods of short, rapid breathing began to return to normal. People should be aware that they can find simple, inexpensive solutions to their problems.